I love cheesecake! This cheesecake recipe is a real winner. This is a lovely baked cheesecake, perfect for serving guests. It is baked in a springform pan. Mix the melted butter and graham cracker crumbs and pat into a 10 inch springform pan. Set aside. Separate the eggs. Set the whites aside. Beat together the egg yolks, cream cheese and sugar until very smooth. Beat the egg whites until stiff but not dry. Fold the egg whites into the cheese mixture. Pour the batter into the pan and bake for 20 minutes. Let cool 5 minutes. Raise the oven to 400°F. Mix the sour cream, vanilla and icing sugar and spread on the warm cake. Bake 5 minutes more. This cheese cake is perfect served simply with fresh fruit on top, or you can add your favorite dessert sauce. Try it with lemon sauce, blueberry sauce, chocolate or caramel sauce. 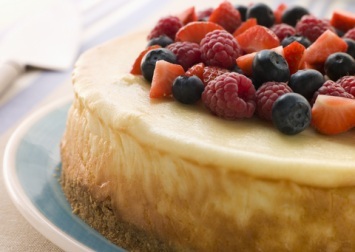 Everyone loves a luscious and creamy cheese cake, so treat them with this great dessert recipe. If you love this cheesecake recipe, but want a more casual dessert, try these lemon cheese cake squares.